I am so happy I have finally seen @ErmonelaJaho's legendary Violetta. No recording can replace witnessing a great performance live. So dramatic! And it's dark in the theatre, so one can cry freely. I probably shed a year's worth of tears in Act 3 alone. #ROHtraviata Charles Castronovo and Igor Golovatenko as Alfredo and Giorgio Vermont were excellent as were @ROHchorus who were in splendid voice as always. ???????????????? 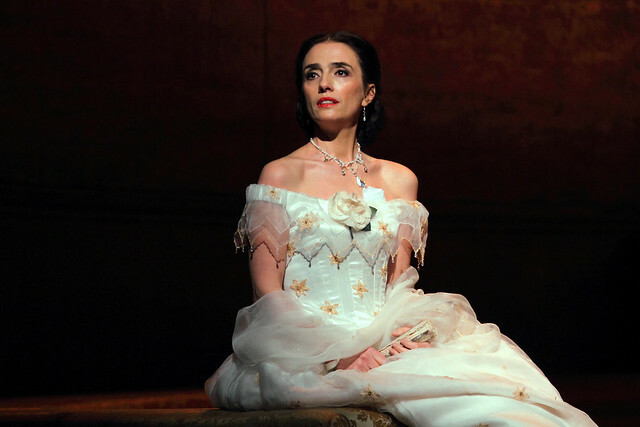 Grazie @ErmonelaJaho, tonight you have reminded us why we love opera. Enjoying the fabulous @ErmonelaJaho in #ROHtraviata tonight at @TheRoyalOpera - thank you for your beautiful and fearless singing!! What did you think of La traviata 2019? 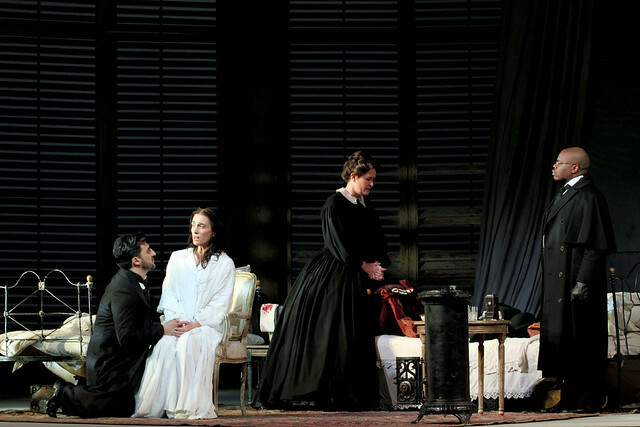 La traviata runs until 31 January 2019. Tickets are still available. La traviata will be broadcast in cinemas on 30 January 2019. No matter how many times I see this production it still has magic. Really looking forward to hearing Ermonela Jaho in the role. Well that more than made up for Carmen. I bought myself a ticket after seeing Carmen in the hope of restoring my faith in The House. What I wasn't prepared for was Ermonela Jaho, I've seen this production many times over many years and I wasn't expecting to be so enraptured but my *** she's phenomenal. That voice. Complimented by the male leads who gave her room to shine, but she completely stole it. Heavenly. Thank you so much for restoring my faith. Good luck creating your list! You are a captivating woman, Ermonela. I felt so lucky to see you. Thank you for your sublime singing which covers so many variations in such a beautiful voice. You made me cry. I also loved the cast and staging. A spectaular evening. Outstanding performance. Still under the spell. Ermonela was brilliant and captivating. One could feel the pain her character was going through. She owned the stage and the audience. Completely baffled by her grace and talent. I too was transfixed by several of the performances in last night’s La Traviata. Ermonela Jaho grew on me, after an ‘iffy’ start, Charles Castronovo was brilliant throughout and of course Placido Domingo excited everyone with the richness of his voice. By Act III Ermonela had completely turned me around and I shed a tear as she agonised towards her last breath. I felt I was holding my breath with her! Fabulous production & stunning set. ROH continues to deliver. Magnificent performances in La Traviata tonight. Angel Blue was a revelation. Phenomenal, powerful singing and a truly credible, moving interpretation of Violetta. Benjamin Bermheim more than justified his hype. He brought genuine pathos and texture and three-dimensionality to Alfredo - normally a bit of a thankless role I feel - and sang with expression and feeling. The young Russian playing Giorgio has a rich, warm baritone and the supporting roles were well-cast and well-sung throughout. 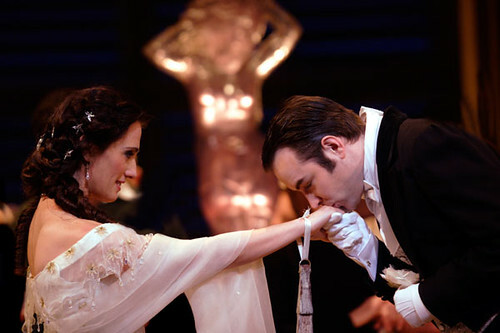 I’ve seen many La Traviatas in my time and this was one of the very best. It was my daughter’s first La Traviata - but certainly not her last - as she was mesmerised and moved in equal measure. The production is a reliable old workhorse and not one I normally care for but with such talented singers/actors on display, this didn’t matter. The show came to life in a new and original way and seemed remarkably fresh. Well done ROH. Saw angel on her debut. Hope she got enough applause to want to return . I cheered as loud as I could so please come back angel. Angel Blue was fantastic, amazing singing, beautiful control, wonderful presence. Really extraordinary revelation, please come back often! What an amazing introduction to opera for our children! We were all enthralled and deeply moved. Thank you, thank you, thank you to all at the ROH for making such an effort, from those running pre-perfomance workshops to the cast that took us on an emotional rollercoaster. You created a transformative experience and 3 brand new opera fans! We are indebted to you all. Ermonela war ganz großartig sowohl stimmlich als auch darstellerisch!! Sie hat mich zu Tränen gerührt. Aber auch die anderen Darsteller große Klasse. Besonders Placido D. Ein wunderschöner Abend!! I have never been to an opera house and was excited to see the live stream from ROH. However I was terribly disappointed. At first I wondered whether it was the production which was dated but then realised that it was the poor filming that was the problem. 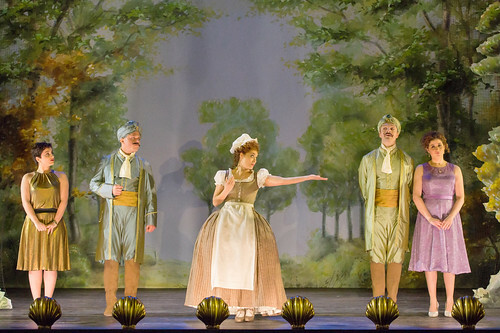 The production contains big acting and singing. It also has a big set which I believe was used to contrast the scenes with crowds and the isolation of Violetta. Unfortunately this was all lost by the constant close ups on the singers. Even where there were two singers only the camera switched from a close of one to a closeup of the other thus losing the reactions of the performers to one another and their relationships. It was even worse in the party scenes where closeups of the principals and the odd dancer robbed the cinema audience of the real spectacle. The whole point of “grand opera” is surely the big performances which don’t work in intimate cinema closeup. These performers aren’t screen actors. I’m sad to say I wouldn’t go to another live stream. I just wish I could see a live performance. The power of Ermonela's performance, and exceptional acting, will stay with me always - absolutely unforgettable and heartbreaking. An excellent performance from Castronovo, too, and it was a delight to hear Placido again. A wonderful, and moving, La Traviata. I was totally emotionally drained by Violeta. It was so real I started thinking how can anyone so Ill sing so well! Stupid I know, but I doubt if I'll ever see anything as perfect again, although I did think Placido a bit wooden. Maybe it's just the contrast. Sensational. An artistic and multinational triumph. Albanian soprano playing Violeta ,American playing Alfredo, Spaniard Plácido Domingo, all singing in Italian with an Italian conductor.and produced and directed by English. I watched surrounded by adoring Spaniards in my local cinema in Spain. The perfect antidote to Brexit. Last night's opera will stay with me for the rest of my life. It was absolutely magnificent. Ermonela Jaho's performance was truly breathtaking and there wasn't a dry eye in the audience. The production was tremendous and the entire cast gave everything they had to make this an unforgettable night for millions of people throughout the world. Placido Domingo was of course the icing on this beautiful cake! After my great disappointment with the Queen of Spades I was very much looking forward to La Traviata, an opera I know very well, in fact I remember all the arias. However, I particularly wanted to see Ermonela Jaho who I saw also in other roles, particularly as Sueur Angelique and she was then a revelation for me. I also expected her to be the best Traviata and she sure did not disappoint me.Like with all the others here, my eyes did not remain dry.She is an incredible artist and I will go to all operas in which she appears. All the other singers, particularly, Alfredo were also excellent. I love this production and attending on 30th was very special. Jaho, who I try to see whenever she sings in London, was sublime in Acts 2 and 3, but her voice seemed to lack heft for the Act 1 Sempre libera. This was amply compensated for by her heart-wrenching Act 3 demise. But the real star of the show for me was Domingo! At 78 years of age, he is a phenomenon! He suited the part of Giorgio Germont perfectly. Yes, he should be a baritone for the role, but what he delivered was singing and acting befitting the great artist that he is. Bravissimo! Ermonela mesmerised, enchanted and enlightened me as she inhabited the very soul of Violetta. Quite simply, she has transformed me. And so I am profoundly grateful to this extraordinary woman. This production has been a showcase for many of the world's finest singers in the world in its countless revivals. Gheorghiu gave one of the most remarkable performances I've ever seen; and I thought that nothing would ever beat Netrebko, Kaufmann and Hvorostovsky. But this was as fine any Traviata I've seen. In particular Ermonela Jaho was utterly outstanding and in the last act was more intense and moving than any Violetta I have seen. I went with two music students who were overwhelmed and inspired by it. An absolute triumph! I saw angel blue as Violeta in the house and ermolena in the cinema. It’s not fair then for me to compare. Singing was excellent in both cases. Stand out for me was the country house scene with angel blue at one end of the table singing to Georgio Vermont where he is trying to persuade her to leave Alfredo. I felt I would need an axe to chop the table in half to break the tension absolute magic. I attended the encore performance of La Traviata yesterday. A great show, a better one is hard to imagine, marred only by 'the padding' and unnecessarily long intervals between acts. We all had a handout of the plot and cast so can these intermissions be shortened please? Absolutely magnificent and deeply moving. I was fortunate to attend the last performance of La Traviata with Angle Blue as Violetta on the 31st of January. Our seat, in the middle of the orchestra stalls, was perfectly situated to marvel at the stunning production. The highlight was Angel Blue delivering a stunning performance. Her graceful acting and spellbinding voice was extraordinary. Oggi mi è tornata l'immagine di Ermonela nella Traviata sentita a gennaio 2019 al cinema. Uno spettacolo talmente denso di emozione che dovrei tornare indietro nel tempo a Maria Callas. Ma la Ermonela non ha nulla da invidiare agli altri mostri sacri. Troppo brava, bella, sensuale, insomma fantastica!!! Ermonela jaho perflrmance is fantastic. The theatral strength is impressive. Thank you for all the emotions. I loved all the performance. And an amazing plácido domingo.